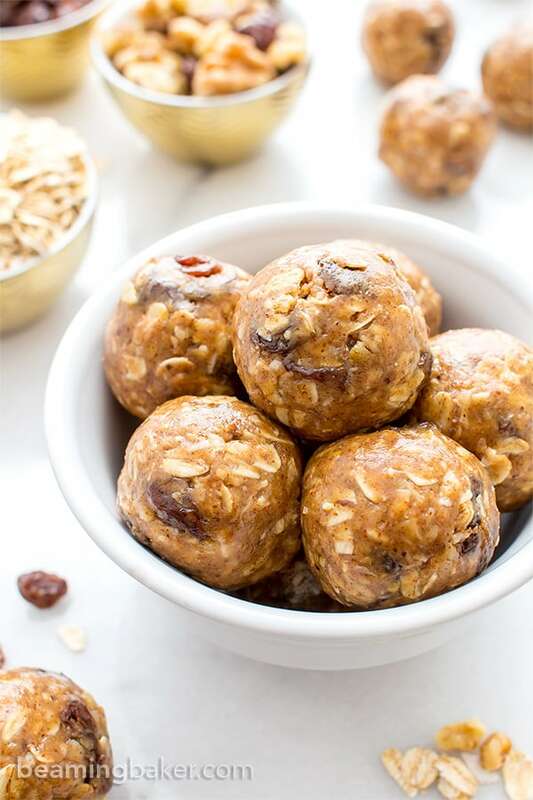 No Bake Oatmeal Raisin Bites (V+GF): A super easy, one bowl recipe for healthy energy bites bursting with oatmeal raisin cookie flavor. Vegan and Gluten Free. Okay, you’re probably gonna laugh at me. Which is probably why you’re here in the first place. It is my pleasure to poke fun at myself, for you, especially if it can bring you a smile or two. Imagine me slipping on a banana peel over here. But not, because that would really hurt. Oh yeah! So some of you may know that I have a very special place in my heart for no bake treats. In fact, that place is probably where all of my baking pans, oven mitts and cooling racks go to hide after they’ve had it with the oven. I mean, I personally like to hide head there from time to time. Especially when things like this happen. Truth be told, I used to think that no-bake stuff was weird! Like, “what do you mean you don’t have to bake it?” Imagine my eyes narrowing suspiciously at this concept. 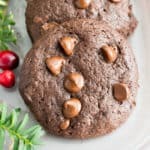 And, “wait, no battles with the oven, not even the slightest whisper of a fallen cake need to happen to make these treats?” What culinary wizardy may this be? No bake recipes just seemed too good to be true. But one day, I decided, I’d had enough with that highly temperamental oven, all of that space scientist precision-required flour measuring, and I was just plain old tired from the week. So I put on my sharpest-looking glasses (bc people with glasses are smarter, duh), rolled back my sleeves and put on my figurative starchy-white lab coat. It was time to get my no-bake on! I created a recipe that… well, gave me a LOT of trouble at first. It was too wet (trial 1 & 2), too dry (trial 3 & 4), and then just right (trial 5). Again, I somehow managed to make something that’s supposed to be fairly simple, well, fairly complicated. I may or may not have a Mensa-level PhD in doing this… now that I think about it. However, I like to think that my life is like a Simpsons episode: I start off at Point A, move in a beeline from Point C to Points That Don’t Even Exist, to Parts Unknown, swirling and zigzagging along the way, taking a nap, getting all hyper for exactly two hours, maybe even visiting Comic Book Guy, involving myself in hijinks, and then returning to Point A. Pleased as can be, happy ending in tow. 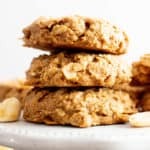 Those Peanut Butter Love bites spawned so many different bites on the blog, I was starting to consider renaming this blog to Beaming No-Baker. That just sounds so… uh…. unfortunate, doesn’t it? You can be honest. We’re all friends here. Ahem. 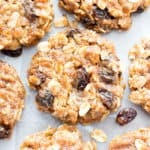 The best part is, I was able to happily and easily adapt my pb coco bites recipe into this no bake oatmeal raisin bites one. No Simpsons zigzagging; no hijinks whatsoever. Plus, who doesn’t love a good oatmeal raisin cookie, right? I know Homer would eat this entire batch, and then order like 500 donuts to wash it all down. There I go with my chatty zigzags again. 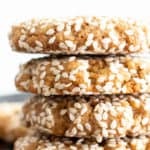 So join me in making these wonderfully healthy and delicious no bake oatmeal raisin bites. Give your oven and yourself a rest. Time to start planning that summer vacation! 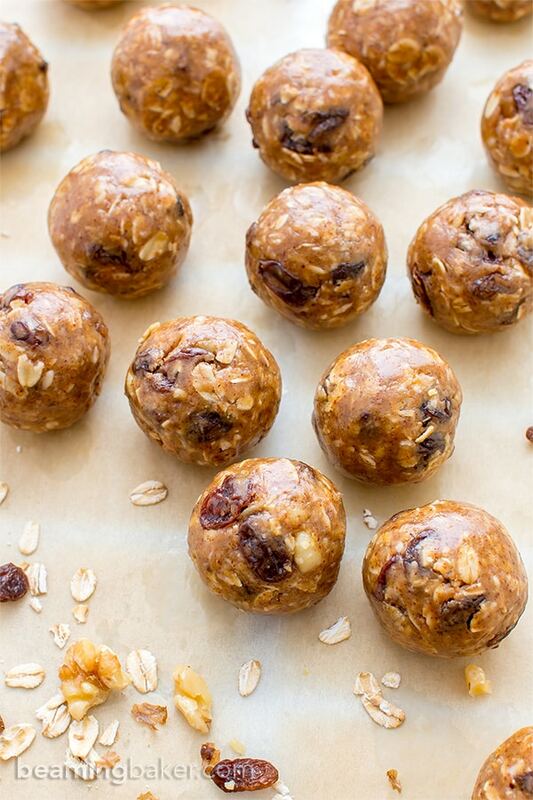 No Bake Oatmeal Raisin Bites (V+GF): A super easy, one bowl recipe for healthy energy bites bursting with oatmeal raisin cookie flavor. Vegan, Gluten Free. In a large bowl, mix together all of the dry ingredients: raisins, walnuts, oats, coconut, flax and cinnamon. Add almond butter and maple syrup. Using a sturdy spatula, stir and fold together until well incorporated. Scoop mixture into your hands (mine are 2 tablespoons each). Roll and press into bites. If the mixture is a little dry, add in a little more almond butter or maple syrup. Enjoy! - Store in an airtight container for up to 2 weeks, at room temperature. If you like them extra firm, you can store them in the fridge. 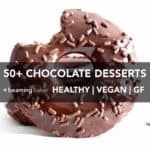 - Adapted from my No Bake Peanut Butter Coconut Bites (Vegan, Gluten Free). 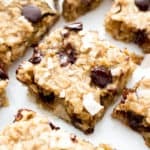 - More oatmeal raisin goodness: no bake bars, cookie bars. Oatmeal raisin cookies are even yummier in bar form, dontcha think? 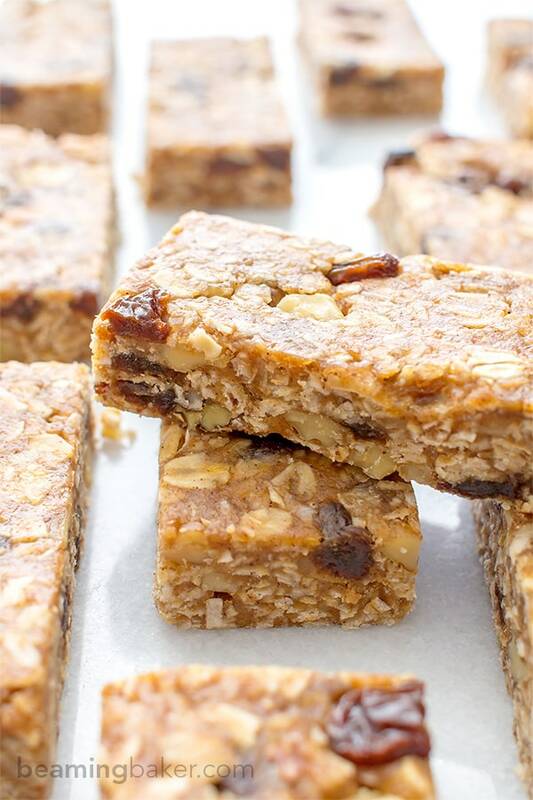 Try my Oatmeal Raisin Cookie Bars (Vegan, Gluten Free). No bake comes in all shapes and sizes. 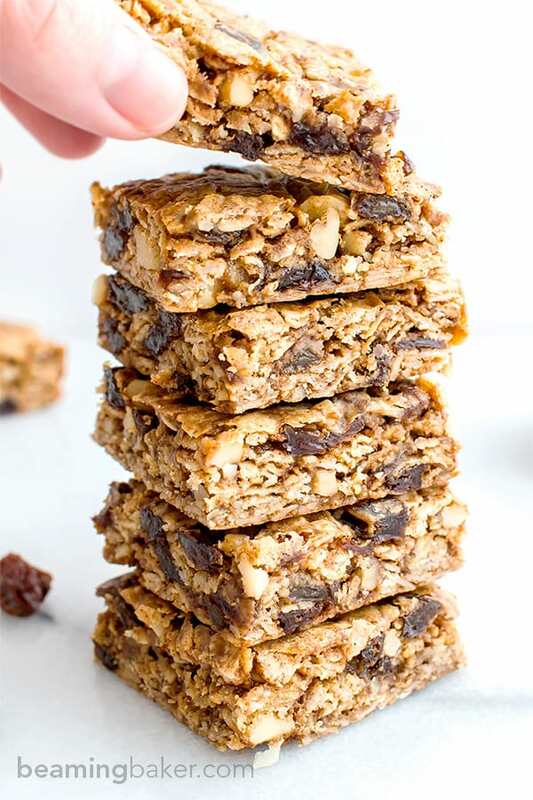 Try my No Bake Oatmeal Raisin Granola Bars (Vegan, Gluten Free). Have you ever made anything really simple, well, really complicated? Aren’t no-bake treats the best? I agree though, I think I was slightly suspicious of them when I first considered the concept, too. To me, it meant a lazy’s person’s way of making something. But, once I actually tried it, I was hooked. 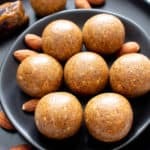 Energy bites are one of my favorites, and I’m so glad that you finally perfected your first recipe after the 5th attempt. And these oatmeal raisin ones look fantastic! I know I would have a hard time not devouring the entire batch in one sitting. Pinning these, of course! Hope your Monday is off to a great start! Totally and absolutely the best. Especially with busy schedules and impending heatwaves. 😉 Consider us both “lazy” now! 😉 Thanks so much for stopping by, Gayle. Hope you’re having an awesome Monday too! Another great recipe, Demeter! I can understand your skepticism about no bake treats, but you totally rock them now! Funny how you talk about The Simpsons. That show is so great, isn’t it? Hubby loves it!! He has Homer slippers and everything that he wears on the weekend. Adventure time is awesome too. So many funny lines. Love Lumpy Princess! 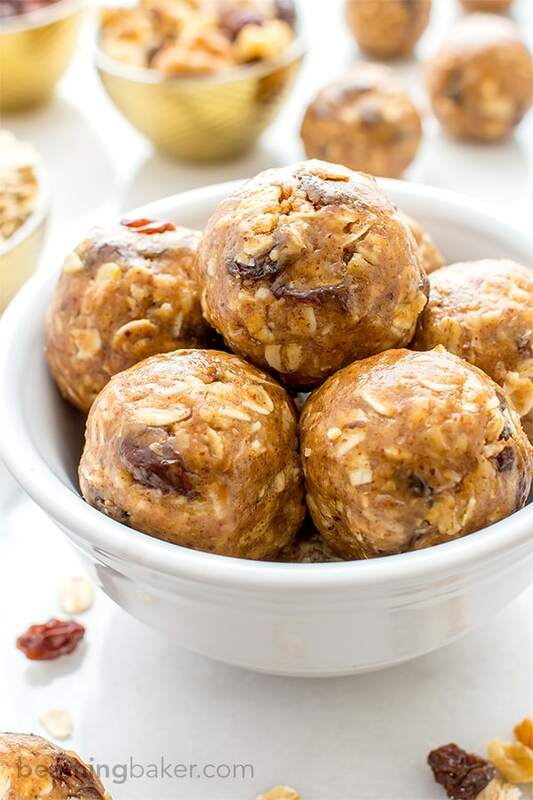 I am so glad that you decided to get your no-bake on as these bites sound wonderful – loving the walnuts in them, BTW! 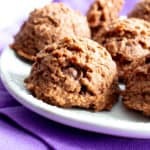 I first stumbled on a no-bake recipe involving coconut flour, many moons ago – back then I had no clue what coconut flour was – and I was totally baffled that a treat could have flour in it and not be baked! I was stumped but Google came to the rescue as it always does and voila – enlightenment! Also, BTW, no matter how zig-zaggy or rollercoasty life gets – it DEMANDS naps! Happy Monday Demeter – hope your week is wonderful and you DO NOT slip on any banana peels! No bake for summer is just ideal! No need to lite the oven. Plus, we don’t have AC so extra heat during the summer is not good. Was just reading too how eating walnuts cut down on belly fat. yippee skippee. So true, Laura. Who wants to turn on the oven? Yippee skippee: Lol. Hope you get a chance to enjoy these (as well as some cool breezes through your home). 🙂 Thanks, friend! 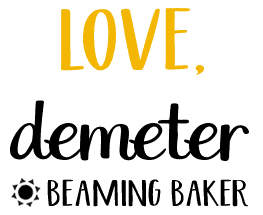 Bahahhahaha- I donno… Beaming No-Baker does have a nice ringtone to it. 😉 I remember the first time I heard of no baked treats, I had the same reaction – “say whaaaaaa?”. How exactly does that work? Treats are supposed to come from the oven… what sort of hoot-in-anny is this? ?” Boy was I wrong… and apparently you too, huh? 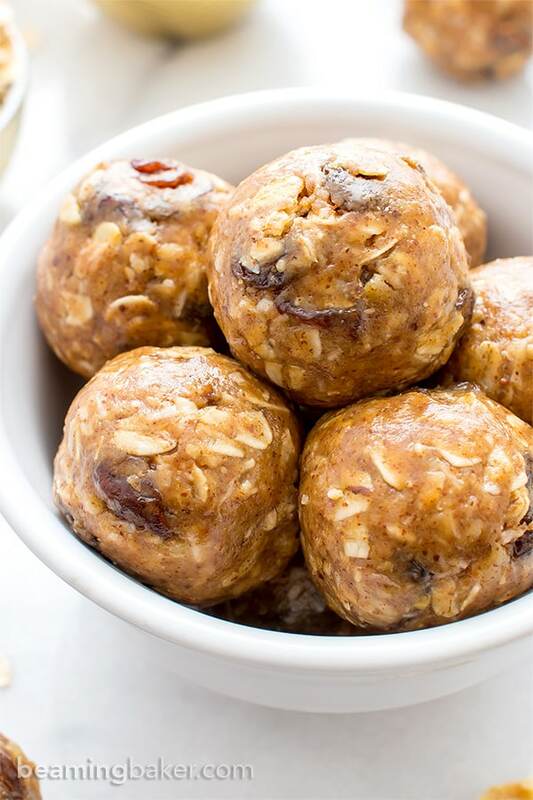 <3 I love all your no bake bites, but this one might be my favorite! You know I'm a HUGE fan of oatmeal raisin cookies, so these beauties definitely have my name written on them!! Can't wait to try these girlfriend! Pinned! Riiiight? Lolol. Ahem. Hoot-in-anny: Haha. Is that how that noise is spelled??? 😉 Yup, we can just go ahead and be so wrong together. Isn’t that what friends are for? 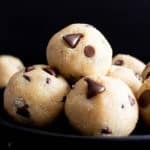 Girl, I will straight up write your name in raisins on these bites! <3 Thanks for pinning! P.S. WHAAAAA? It's still not too late, my friend. No more womps for you, just smiles. 😉 Muah! Can I have one, or maybe two, right now as I’m drooling over the keyboard while trying to write you a comment, pluueease? 🙂 Love them, love raisins and oatmeal! And they’re no-bake which is something I should do more often! Pinned! Have a great week, my friend! Yeah, that name sounds good, you should consider. You know, Demeter, I’m always so thankful for your no-bake recipes! Your baked goods look amazing too, but I am really not able to do such things. Plus though I rarely have sweet cravings, whenever I do they come so suddenly and unexpected I wouldn’t be able to wait hours for a cake. 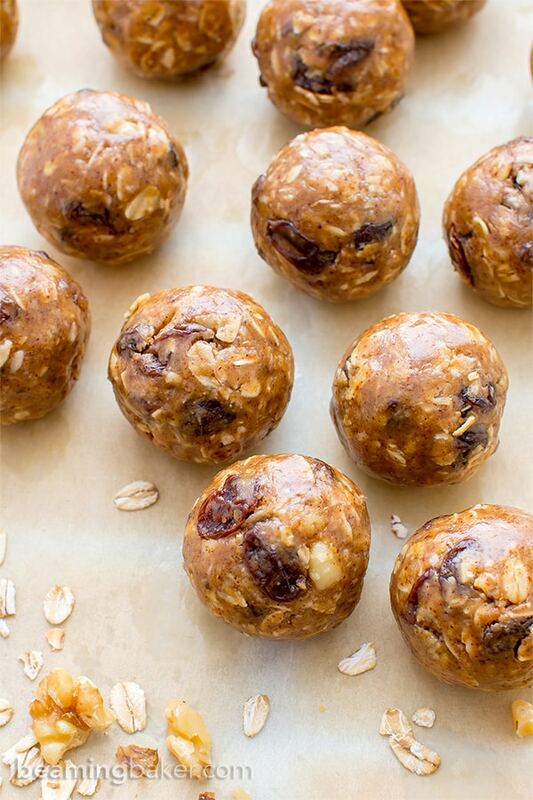 All that can help is some quick no-bake treat! Lol. Oh yes, to no bake! Rolling like a hundred down the road to ya, Kate. 😉 Thanks my dear! Love no-bake recipes! These oatmeal bites look delicious, Demeter! 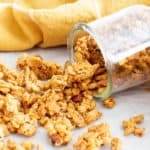 🙂 A great snack recipe – can’t wait to give these a try. Pinned! Oatmeal cookie dough is my absolute favorite to snack on so these will be dangerous for me ? I love your recipes so much Demeter! I can’t even tell you how many times I’ve been on Pinterest lately, seen a recipe that instantly catches my eye and my tastebuds, and seen it’s from your site 🙂 And these little delicious bites are certainly no exception! Aw, thanks so much Natalie! What a funny coincidence… I do the exact same thing on Pinterest when I see yours. 😉 Thanks for stopping by!